Abid Rehman (National University of Sciences and Technology, Islamabad) and Kinza Tahir (National University of Modern Languages, Islamabad) argue that in order to reduce external debt, Pakistan should focus on the non-debt-creating inflows of the economy, such as foreign direct investment and exports, rather than accumulating more debt-creating inflows in order to repay previous debt. Pakistan’s troubled economy is one of the great challenges facing the country’s 22nd Prime Minister, Imran Khan. In his maiden address to the nation, a day after being sworn into office, Khan identified what he believed was one of the key problems facing the country: the ongoing debt crisis. The Prime Minister declared to the nation that Pakistan had never faced a debt burden of $95 billion. He explained to the country that the interest the state would have to pay on such debt had now reached such a high level that the government has to now take on more debt just to repay its obligations. In a bid to face down the crisis, Khan appealed to all overseas Pakistanis to send remittances through banking channels, so that the foreign reserves of the country could increase. Khan’s is right to focus on the country’s foreign reserves. The above graph demonstrates the country’s foreign reserves since 1980. Pakistan’s foreign reserves started increasing from 2001 following an increase in aid from the US, and continued to increase until 2011. In 2012 reserves, however, fell by $6 billion. 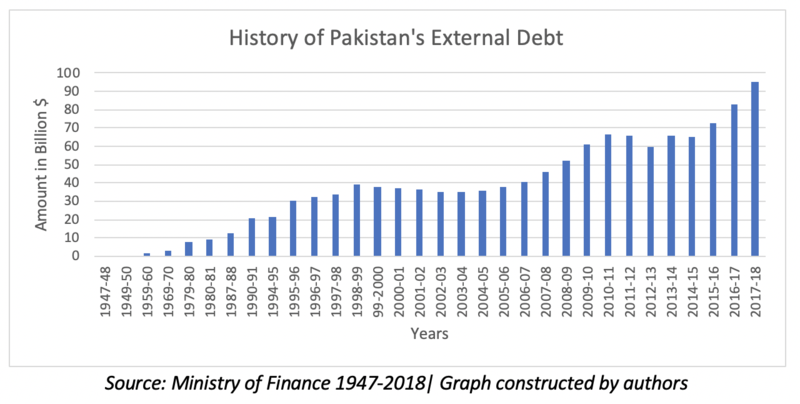 The following year when the PMLN came to power, the party borrowed money from lending agencies – the reserves of Pakistan subsequently improved. A major increase also occurred in 2015, as Pakistan received an inflow of $717 million under the Coalition support funds. In 2017 Pakistan’s reserves increased by $2.5 billion due to the floating of dominated bonds in the international market. While in 2018 the reserves of Pakistan steeply declined as the State Bank of Pakistan made high payments worth $919 million and $1.25 billion, including a principal payment $780 million against Pakistani sovereign bonds. The total reserves as a percentage of total external debt are considered a good indicator to gauge the debt repaying capacity of a country. During the administration of President Musharraf, Pakistan’s total reserves were bolstered thanks to an increase in exports, FDI, and remittances. 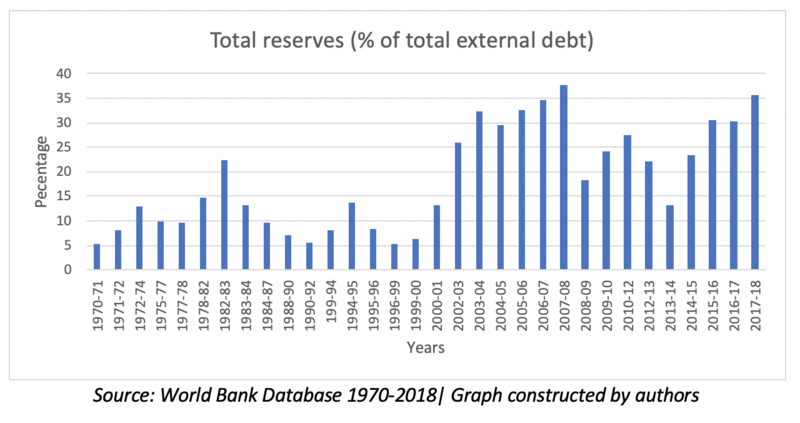 Between 2006-2012 total reserves decreased as a percentage of total external debts by 12.5%, which subsequently reduced the debt repaying capacity of Pakistan. After this period the reserves of the State Bank of Pakistan improved during 2017, as the government took measures towards talking long-term borrowing. Debt servicing is also one of the reasons for the decline in foreign reserves. Pakistan’s total debt and liabilities are sharply increasing and have reached 29.861 trillion Rupees. The graph above shows that the country’s debt servicing was $7.479 billion in 2017-2018, which includes the principal amount of $5.186 billion and $2.293 billion of interest payments. The problem of debt servicing in Pakistan has become so big that the current account deficit was $18 billion in 2017 and now reaches $21 billion in 2018. Pakistan has been extremely successful in attracting foreign direct investments and therefore has witnessed an improvement of its foreign currency reserves. In the fiscal years of 2014-15, the largest contribution came from China ($229.5 million); the United States ($238.7 million) and the United Arab Emirates ($222.4 million). 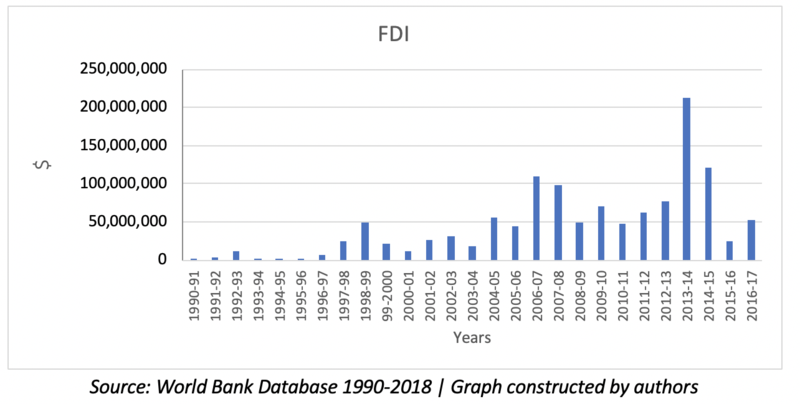 During the following year however, FDI decreased due to many investors being put off the country due to the energy crisis and political instability. Pakistan could once again increase FDI by providing a friendlier economic environment, by implementing effective trade policies, and offering tax incentives to foreign investors. This impact of foreign direct investment potentially could be massive on the current account deficit while also strengthening the nation’s currency. The rapid increase in remittances sent to Pakistan from abroad has played a vital role in the development of the economy. Most remittances in Pakistan are received during key religious events in the country, mostly from the Middle East, the UK and the USA. In his maiden speech, Khan requested more remittances from Pakistanis overseas. He did so on the back of a progressively positive historic trend, as shown above. Such remittances, however, have not been sufficient to overcome the country’s debts. The bid to further increases remittances, however, is a good sign for the health of the economy as it continues to increase the foreign reserves within Pakistan increasing the debt repaying capacity of the state. 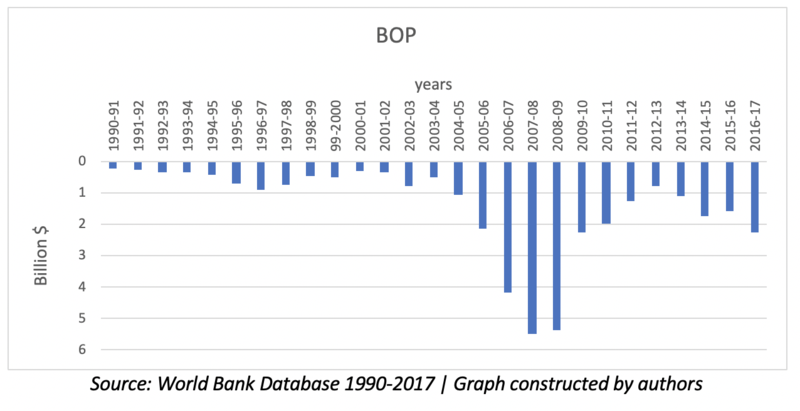 Pakistan has been facing a balance of payments crisis for the three decades, which is among one of the reasons for ballooning external debt. In order to reduce the balance of payments issue, the Pakistan government must broaden its export base, which is currently very narrow, and devalue the Pakistani Rupee against the Dollar due to exchange rate volatility. To some extent, the government of Pakistan has tried to resolve this issue through increasing exports by reducing export duty and making quality products through labour-intensive industries. In such a way the government will be able to build foreign reserves, meaning a need for external loans will be minimised. Servicing the country’s external debt would sustain a larger problem for Pakistan’s current expenditures. A large deficit in Pakistan is increasing because the country is dependent on borrowing from external resources rather than focusing on the non-debt creating inflows such as foreign direct investment and exports. 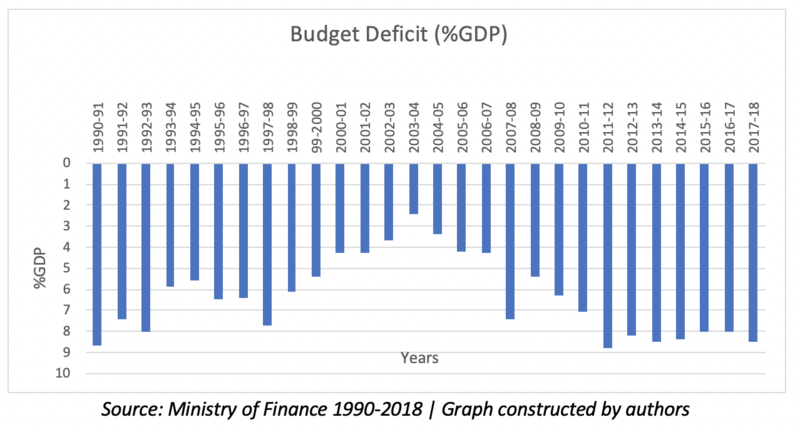 Reasons for the increase of the budget deficit are due to a low collection of tax and inefficiency within the tax system, as shown in the above graph. The government can reduce the fiscal deficit by reducing spending on public services. Increases in the tax base can help the government to generate revenue and further increase economic growth, which would be the best way of increasing revenue. With the help of this revenue Pakistan would be able to pay the external debt it owes and the interest it continues to mass on such borrowing. Abid Rehman is a PhD Fellow in Economics and Visiting Faculty Member at the National University of Sciences and Technology, Islamabad. Kinza Tahir is a final year student of Economics and Finance at the National University of Modern Languages, Islamabad.